Added API for applications to create custom hyperlinks in RSyntaxTextArea, though this API should not be considered stable. 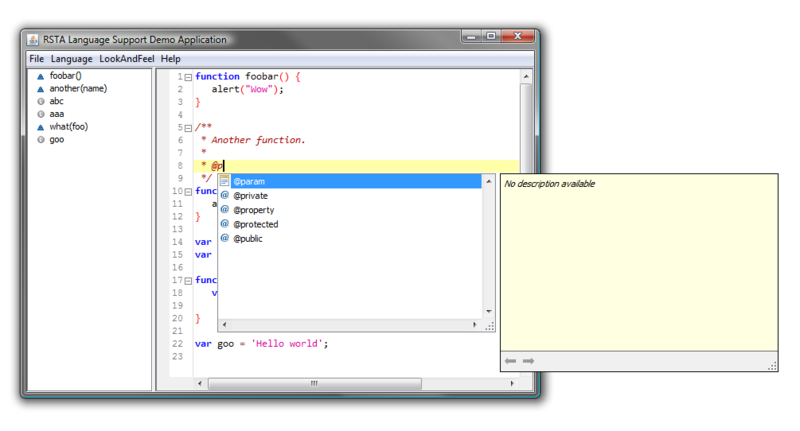 Added “mark occurrences” support for XML. Currently just highlights the tag name at the current caret position and its match. Fixed issue when auto-inserting spaces for tabs. Major refactoring of rendering code. “Traditional” selection rendering is now supported; that is, selected text can now be rendered as syntax highlighted tokens with a “selection” background (as it was previously), or as text as a single color with the “selection” background (as standard text components do). See RSyntaxTextArea.setUseSelectedTextColor(boolean). Added some new token types to better differentiate markup tokens from “regular” language tokens. 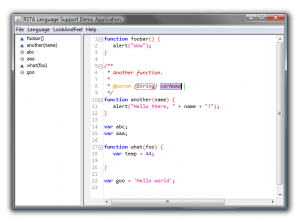 This allows for better syntax highlighting for stuff like HTML, JSP, and PHP. 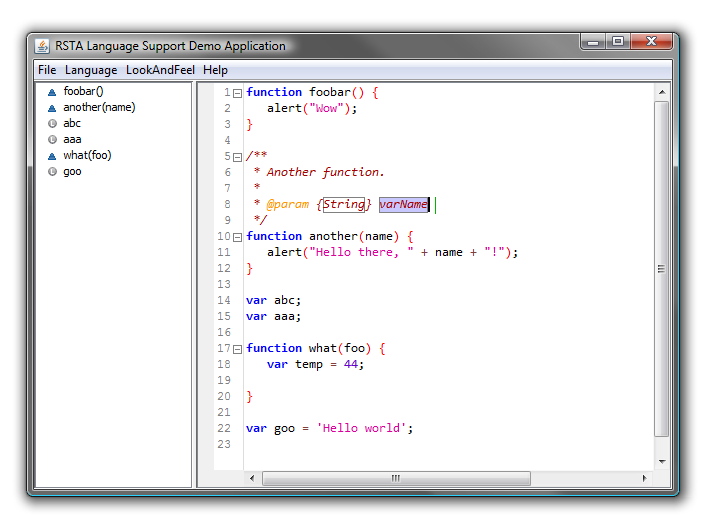 Added Visual Basic syntax highlighting. In RSTAUI, a new TextFilePropertiesDialog was added. This dialog shows the currently edited text file’s path, size, word count, encoding, line terminator, and more. Further, when using a TextEditorPane, you can modify the file’s encoding or line terminator directly from the dialog. RSTALanguageSupport: HTML, PHP, JSP and XML now have an option to automatically add closing tags when opening tags are typed (e.g. add “</foo>” when “<foo>” is typed). By default this option is enabled. 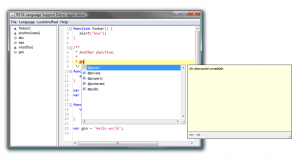 HTML, PHP and JSP only auto-close tags closeable in the HTML 5 spec; XML closes all tags. This option is separate from the XML “auto-complete closing tag name when ‘</’ is typed” option. This entry was posted on Sunday, April 28th, 2013 at 11:14 am	and is filed under AutoComplete, RSTALanguageSupport, RSyntaxTextArea. You can follow any responses to this entry through the RSS 2.0 feed. Both comments and pings are currently closed.